The following blog comes from Brian Caulfield. Brian is a communications specialist for the Supreme Council of the Knights of Columbus and is the editor of Fathers for Good. On May 9th, Brian will be a guest on Witness. 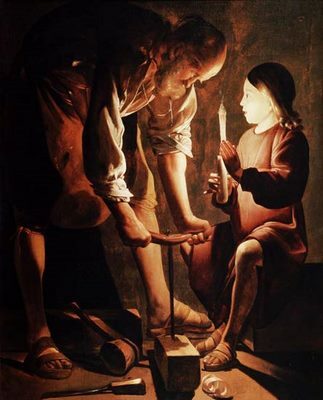 What image do you have of St. Joseph? Maybe you see a middle-aged man, staff in hand, leaning protectively over the manger, a bit in the shadows as Mary and the Christ Child beam with radiant light. Or else you may have in mind the popular statue pose of Joseph, with a lily in his hand that symbolizes purity. Well, today, the Church would like us to have a more dynamic image of Joseph as a man in the world who is involved in skilled labor and commerce. May 1 is the feast of St. Joseph the Worker. As a family man who edits the website Fathers for Good, sponsored by the Knights of Columbus, I find this workaday Joseph a fitting model for my own life. First, a little background. There are two feast days for St. Joseph, a solemnity on March 19 when we highlight his role as husband of Mary and head of the Holy Family. This observance goes back a few centuries and is usually the setting in which we think of Joseph. In our daily grind, we can often think of work as a punishment that began with Adam in the Garden. We plow through each day, waiting for the weekend. With this perspective, work is simply something we do to earn money; a necessary evil we endure to gain something else that we desire. Yet that is not how the Church urges us to approach our work, and on this feast of St. Joseph the Worker, we should take a moment to reflect on what we do from 9 to 5. Anything that takes such a large share of our time must have meaning or be given meaning through faith. In fact, work is noble, dignified, something that should build us up as we labor to perfect some little corner of the world that we have been given. As John Paul wrote, because Jesus took flesh and labored beside Joseph, the whole world of work has been renewed and redeemed. Sure, we may not like our job at the moment. Yes, we may be bored or overworked or underpaid and certainly not fully appreciated. Nonetheless, our work should not be something external or alien to our selves. We need to embrace our work not just as a means for money, but as a mission. We need to perform it with attention and with the intention to do it well for the sake of God and neighbor. Our tasks may be small or large; they may touch the lives of a few or have impact on millions. But the fact that it is my work, and that it is mine alone to do, gives it great meaning and purpose. In my daily interaction with my work, I should emerge a better person. A person who labors for the good of himself, his family and his loved ones; a person who works for the common good. Let Joseph be our guide.